For water and other non-oil-based coatings, you should be able to clean the brush with warm water and washing up liquid. 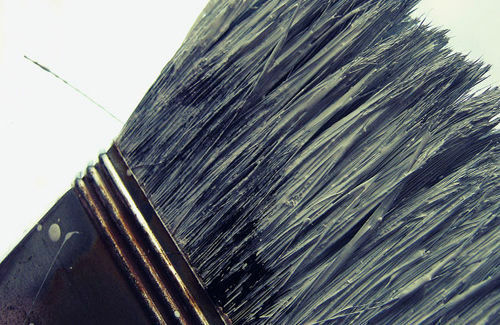 Brush the bristles against the lip of the paint can to draw out as much of the paint as possible, then use an old cloth to remove the excess. This will reduce the amount of paint that has to be washed into the drain. Wear rubber gloves and stir the brush around in a strong solution of washing-up liquid (emulsion paints) or white spirit (oil-based or gloss paints). An old jar is a handy container to clean brushes. Don't use plastic containers as the white spirit or paint cleaning solution may react with the plastic and cause it to leak. Use at least three changes of water or white spirit and fan out the bristles to work the solution into the base of the bristles. Rinse out the brush under the tap until the water runs clear. Dry the bristles on an old cloth and slip an elastic band over the brush bristles to keep them together. To protect the bristles, stand the brushes bristles-up in an old jam jar. If your painting job will take more than a day, stretch some plastic wrap over the paint tray to stop paint drying out overnight. You can also use the wrap around paintbrushes and rollers instead of cleaning them for the next day. DIY stores sell small plastic rings that are pushed over paint rollers and pulled up and down to remove the excess paint. Another option is an adaptor that fits in the end of the roller and is fitted into a power drill. Spin the roller in a bucket and centrifugal force pushes all the paint off.